A nightmare rises from the sea! A prehistoric monster is unleashed on the Atom Age! See a nation tremble in terror! See a mighty city laid to waste! 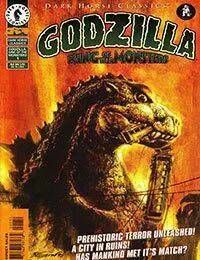 See Godzillas first appearance in the modern world! Originally presented in 1987 in black-and-white, this comic has been newly colored and wrapped with a stunning painted cover by Hugo Award-winning artist Bob Eggleton.